The novel criticizes the patriarchal society that deprives a woman of her freedom to think, feel and act as she pleases. Girls are taught from a young age to betray their own instincts and live a dual life which consists of an inner and an outer self. Edna defies society by moving out of her own home, having an affair and even claiming ownership of her own self. Léonce allows his wife to move out of the house under the pretense of remodeling in order to preserve the image of a happy family. Robert betrays his love for Edna because he is too weak to defy societal conventions and commit himself in a relationship with a married woman. Societal conventions take hold of the characters in the novel and causes them to live under false pretense. Motherhood is portrayed by Adèle Ratignolle as a selfless act of love and society views this type of mother as a mere angel. On the other end of the spectrum, motherhood is slavery to Edna and she often sees her children as an evil entity trying to take away her freedom. These two views of motherhood reflect the romanticist vs realist views held by both characters respectively. This is one of the main themes of the novel as the story of Edna could be seen as an analogy of the feminist revolution. Edna experiences an awakening and discovers the numerous ways she had been oppressed (i.e. as a wife, a mother and a human being). She rebels against her husband, declaring her independence by moving out and embarking on an affair. She admits that her motherhood is a mere mistake, and begins to do things for herself rather than for others. She works on her self-serving art and even gains money while doing what she loves. 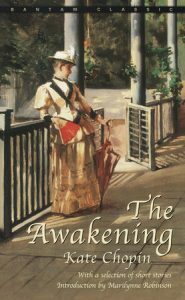 In essence, the novel is the story of a feminist awakening. There were many instances of birds throughout the novel. There is a caged parrot and a caged mockingbird at the start of the novel which represent the oppressed women at the time. Victorian women resemble caged birds who are cared for and nurtured but deprived of their freedom. Mademoiselle Reisz also compares rebellious women to birds who must be strong enough to soar high above society. Before Edna’s apparent suicide, she sees a bird with a broken wing that descends into the water just as she drowns. The last bird to be mentioned in the novel is a symbol of Edna’s failed rebellion as the loss of Robert makes her too weak to defy society. The sea is mentioned often within the novel, however it has many connotations. When Edna first learns how to swim, it is a symbol of her newly acquired freedom. The sea could also represent the uncontrollable current that is society, and her newfound swimming skills could be her awakening and rebellion against society and the current of the sea. In the final chapter, Edna swims herself to exhaustion and drowns at sea. The final symbol of the sea is a reference to Edna’s weakness and exhaustion in defying society as she lets the sea take her. Another interpretation of this symbol could be that the sea is her only escape from society.